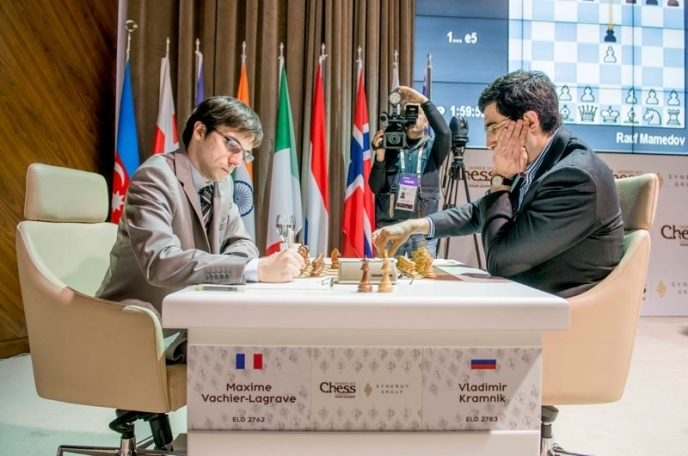 Vishy Anand beat Shakhriyar Mamedyarov in Round 8 of the Shamkir Chess tournament for his third win in four games. It may not be enough to catch Magnus Carlsen, whose draw against Wesley So takes him into the last round with a half-point lead, but if Anand draws with Fabiano Caruana he’ll be back up to world no. 2 on the official May 2015 rating list. Vladimir Kramnik and Michael Adams also scored consolation victories after tournaments to forget. Anand 1-0 Mamedyarov: Did you ever doubt him? 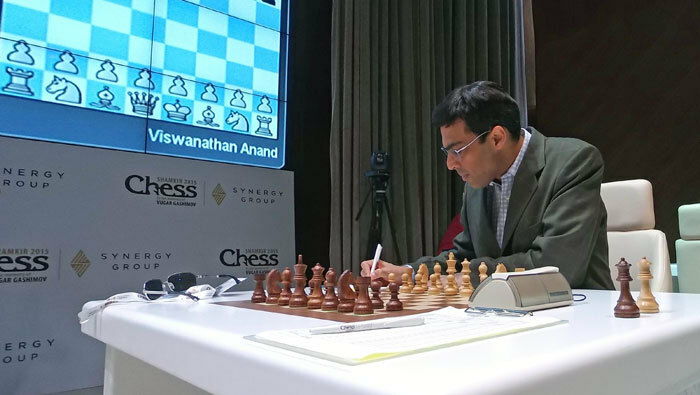 Vishy Anand had a miserable run in his last few years as World Champion and led many to question the whole World Championship system, since on paper it was hard to make a case that he was Magnus Carlsen’s toughest opponent. The first World Championship match did little to change that impression, but ever since Vishy has been proving the doubters (who at one point he admits included himself) wrong. He’s back to regularly winning supertournaments, he dominated the 2014 Candidates Tournament and he gave Magnus a real run for his money in the second match. Now he’s back above 2800 and up to world no. 2 on the live rating list. Vishy's performance is currently 2908, as you can see in the standings of our free mobile apps - for download links see the very end of this report! To be honest, my second just showed me this line and said, why don’t you try it, it’s rather unusual? The Chinese player Wei Yi had just played a game a few days back in Yerevan, so we looked at it quickly. I would obviously prefer to have stuff ready without this last-minute pressure. On the other hand, I have to admit that this last-minute pressure is when I get some of my most productive ideas. That’s just the way it is. The morning before the game somehow I find myself asking the right questions and generally I get good work done, even if it’s a bit in panic. At home you try to think up some concepts which you can use, but I always end up preparing at the last minute anyway. But then, for the nth time in Shamkir, Vishy sacrificed the exchange: 28.Rd5! Mamedyarov accepted, perhaps mistakenly, and although the conversion of Anand’s positional edge wasn’t entirely smooth it was always the case that one error on his opponent’s part could be fatal. In the end it was fitting that the passed d-pawn created by the exchange sac proved decisive. I’d like to congratulate Magnus… it’s been a very dominating tournament for him. Let’s take stock after tomorrow. A lot can happen on the last day. I think it’s important not to look back until the tournament is over. 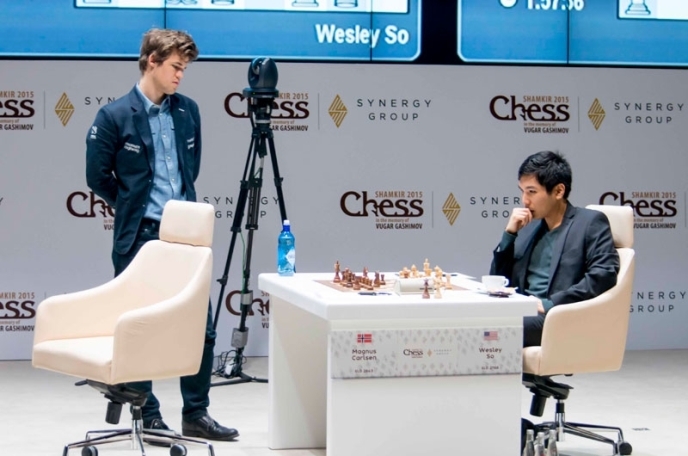 The game itself was a very sharp struggle, with Wesley opening 1.c4 because he wanted to dodge his opponent’s impressive opening preparation. Shortly afterwards So regretted giving up the pawn on d5 and slipped into a difficult position, later commenting, “I was very fortunate to save the game”. The moment both players knew he was safe was 30.e5! Whatever Black does the b3-pawn is falling, and after Magnus’ 30…Bc6 and 31.Qxb3 it was White, if anyone, who still had any chances. A draw was agreed on move 41, and Wesley can look back on two draws out of three games with World Champions in the tournament. I thought I got a pretty interesting position with some chances to play for a win, but I think he played very well and a draw is a logical result. Now let’s finish with two wins for players who had been struggling. Fortunately for me the position was so nice and there was not so much to calculate. Otherwise, of course, I would have blundered something, but it was really difficult. I tried my best, but it was difficult. The variations were not very complicated. All in all, of course, it’s quite disappointing in this tournament, because in general I was not playing too badly, but there were just some bad miscalculations and unfortunately I was punished very severely for it. I was even thinking yesterday [against Magnus] – usually if you miss some little detail in some little line nothing bad happens, but with me I’m simply lost immediately from an equal position, so it was also a little bit unlucky. I think everybody miscalculates a bit or blunders something. Magnus in the first round just blundered a pawn, more or less, but still it was fightable. Somehow I managed to blunder in such a way that I cannot save the game anymore. All in all, it’s clear that my shape was not great. It was not as bad as my result, but it was not great, and I should of course definitely work on my physical shape and my calculation skills. 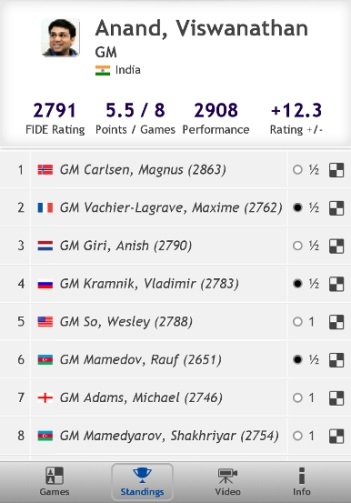 Maxime may have had his thoughts elsewhere, since he revealed that the Grand Chess Tour website (see our article) indeed didn’t lie, and he will, after dealing with “a few technicalities” be the 9th player to compete in all three events. He’d only learned about his invitation a few days ago. I obviously declined this tournament just to let Maxime play – what else! Seriously speaking, I already have quite a lot of invitations this year. My schedule is already quite serious and taking three more tournaments would just make it so totally packed and full that I’m afraid that, first of all, I will not see my family for the whole year and, secondly, I’ll probably end up in a hospital at the end of the year. We should not forget that I’m already not 20. It was a bit unfortunate because I would definitely play one or two out of the three tournaments, but three was a bit too much, because I also have a very important World Cup, which is probably my only chance to qualify for the Candidates and already quite a few other contracts and invitations. 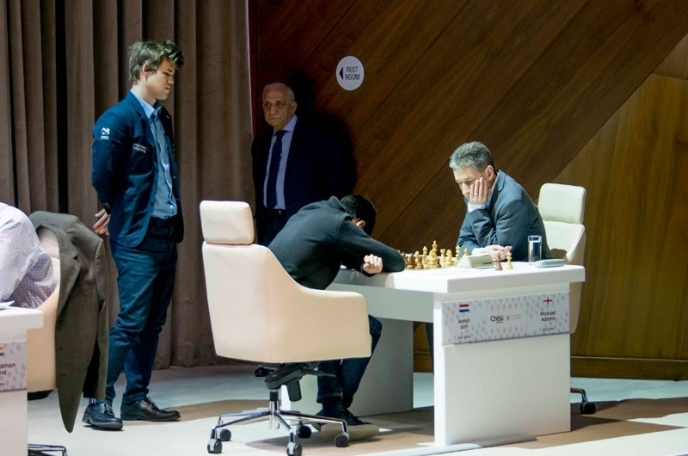 For young players it is, of course, a great opportunity to play three top tournaments, but for me it was very unfortunate that this Grand Prix happened. Unfortunately now I have to skip all three tournaments, which was not what I wanted. But between two bad decisions I hesitated a lot but finally I chose to decline. There are players who can compete. You can say clearly he is the best player in the world – there’s no question about that – but by how much and for how long it will last is a better question for a fortune teller than for me! To be honest, I don’t even think about it. It’s true that Magnus is the best player in the world right now and he proves it in almost every tournament he plays. I’m not thinking about how big the gap is, but about how to reduce it! Michael Adams has long specialised in playing against the Sicilian in such a way that without generating the traditional kingside attack for White he somehow still emerges with a positional advantage. This, however, wasn’t one of those occasions (except in so far as the white king was absolutely safe), but a traditional blockbuster attack. I didn’t really understand the position that much. I wasn’t that desperate at this point. Only a few moves later Adams crashed through with 24.h4!, 25.g5! and 26.f6! Carlsen is, of course, the favourite to win Shamkir Chess 2015, since he has White against the big rating underdog (and birthday boy!) Mamedov, while Anand is Black against Caruana, but it ain’t over until it’s over!